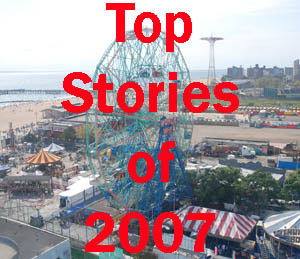 There were many big stories in Brooklyn this year, but there was less drama in 2007, particularly with so many critical and controversial decisions having been made in 2006. Clearly, the Coney Island drama was the top development story of '07, but it was followed closely by the continuing saga of Atlantic Yards, which could still end up as a very different project than the one announced four years ago. Last year, we said that 2006 was symbolically as important as 1957 when the Dodgers played their last game at Ebbets field. This year, we will say that 2007 was more like 1958--the year that reality started to set in. For instance, an entirely new Williamsburg--which currently resembles a construction hell more than a neighborhood in places--started to emerge and Fourth Avenue between Park Slope and Gowanus started sprouting a series of condos. There was certainly less drama in 2007--there were no Greenpoint Terminal Market infernos or caustic and divisive public meetings about Atlantic Yards--but the change that continued to wash over our borough has been no less dramatic and will alter the very fabric of Brooklyn for many decades to life. 1) Coney Island. The year started with developer Joe Sitt sending in bulldozers to clear land, but by year's end, Mayor Bloomberg and Deputy Mayor Dan Doctoroff had declared that Mr. Sitt was toast in terms of Coney's amusement district. The Brooklyn story of 2007 shows every sign that it could be the story of '08 too as a huge battle shapes up. 2) Atlantic Yards. If 2006 was the year that this mega-project created deep divisions in Brooklyn, 2007 was the year of delays, new questions and construction prep work. Will 2008 be the year that ground is officially broken on the project that will change Prospect Heights, Park Slope, Fort Greene and environs forever? Or will a court decision, credit crisis-related issues and a softening real estate market throw more curve balls at this development? Stay tuned. 3) The Rebranding of Williamsburg. The Next Wave of change in Williamsburg, from hipster enclave to Luxury Condo Outpost continued went full speed in '07 and along with it came more embarrassing marketing efforts to sell Williamsburg to an entirely different demographic. More to come in 2008 as more of the unnamed developments under construction start coming to market. 4) The Brooklyn Construction Crisis. 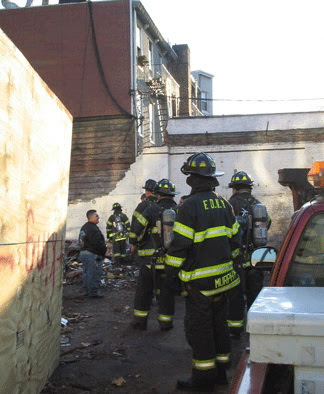 From South Brooklyn to North Brooklyn and ev erywhere in between, the Number One quality of life story in 2007 was the collateral damage of the Brooklyn Building Boom and the Department of Building's inability or unwillingness to do anything to police the process in any meaningful way. While the Department claimed to make strides, it was outgunned and outsmarted at every turn by an onslaught of development that turned the borough into a Darwinian land of survival of the fittest if the construction and demolition contractors got to work on one's block. 5) Landmarking. After 2006 saw the destruction of landmarks like the Greenpoint Terminal Market, Red Hook's Todd Shipyard and Williamsburg's Old Dutch Mustard Factory, preservationists could finally point to some important wins and buildings saved from the wrecking ball. In Williamsburg, several important buildings of the old Domino Sugar Plant (although not all significant historic structures) were landmarked as was McCarren Pool. Significant new landmark districts were also created around the borough in Dumbo, Greenpoint and Crown Heights to name a few. 6) The New Domino. 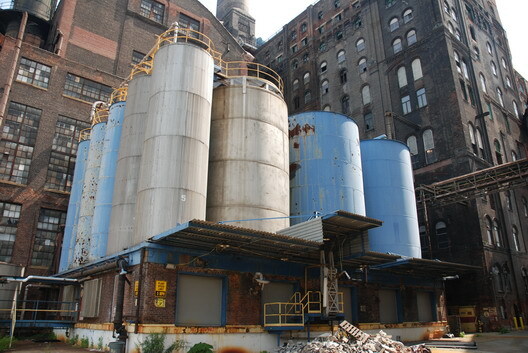 The year started with concerns about the demolition of the historic Domino Plant in Williamsburg. By early summer, developers trotted out plans for the New Domino, with 2,400 apartments and towers up to 30-40 stories tall. It would be the second biggest new development in Brooklyn after Atlantic Yards and would add up to 4,000 residents to Williamsburg. 7) The Flatbush Corridor Boom. No longer the stuff of renderings, the Flatbush Corridor/Downtown boom started in earnest in 2007, with major new buildings breaking ground or underway. The towers will be rising in 2008, forever changing the looking of Flatbush Avenue and surroundings. 8) The Remaking of Red Hook. Anyone who hasn't been on Beard Street in a couple of years will be forgiven for thinking they're in Elizabeth, NJ. Ikea has risen. The Revere Plant is gone. And, the odds are better than 50-50 that quiet Red Hook will be home to endless traffic jams at this time next year. 9) The Carroll Gardens Development Revolt. The plan to build at 360 Smith Street sparked a serious movement to put the downzoning of the entire neighborhood on the fast track. This one isn't over by a long shot. 10) Toxic Brooklyn. 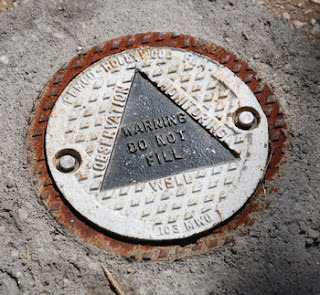 From the hid eous Exxon-Mobil Oil Spill in Greepoint to smaller problems like the Roebling Oil Field and the horrors underfoot in Gowanus, there were a myriad of environmental issues attached to booming residential development in formerly industrial neighborhoods with relatively lax regulatory supervision. How many developers will strike oil in Williamsburg in 2008? Will buyers be interested in luxury condos on sites with questionable environmental pasts as the market softens? So many questions. 11) The Hotel Boom. From almost nothing to thousands of rooms in development, 2007 will go down in history as the year thousands of Brooklynites began to think about being able to find mom and dad a room right in place like Gowanus. 12) Starrett City. Call it the Stuy Town Effect, but Starrett City residents found themselves on the winning end of a battle to preserve affordable housing at the huge rental complex. Opponents torpedoed the sale of the complex, although 2008 will determine whether it was a temporary reprieve or a real save. 13) The Rise of Fourth Avenue. It may not be the new Park Avenue, but with new condos and demolitions everywhere you look (or may not want to look, given how ugly some are), it's definitely not the old Fourth Avenue. 14) No Way to One Way. Rarely have Park Slope residents gotten as riled up as when the Department of Transportation floated a proposal to make Sixth and Seventh Avenues one-way streets. The Slope said shove it, and DOT did. 15) Sludgie the Whale. RIP brave little friend. The tornado didn't make the cut?